Tropical Storm Michael ("S" on the map) continues to move slowly north but will accelerate in forward speed Tuesday. 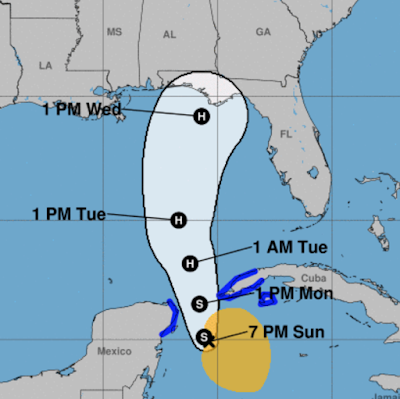 H = hurricane and Michael is forecast by the National Hurricane Center to be a 100 mph hurricane at landfall. I would recommend that everyone from Mobile to Tampa keep a close eye on this storm. 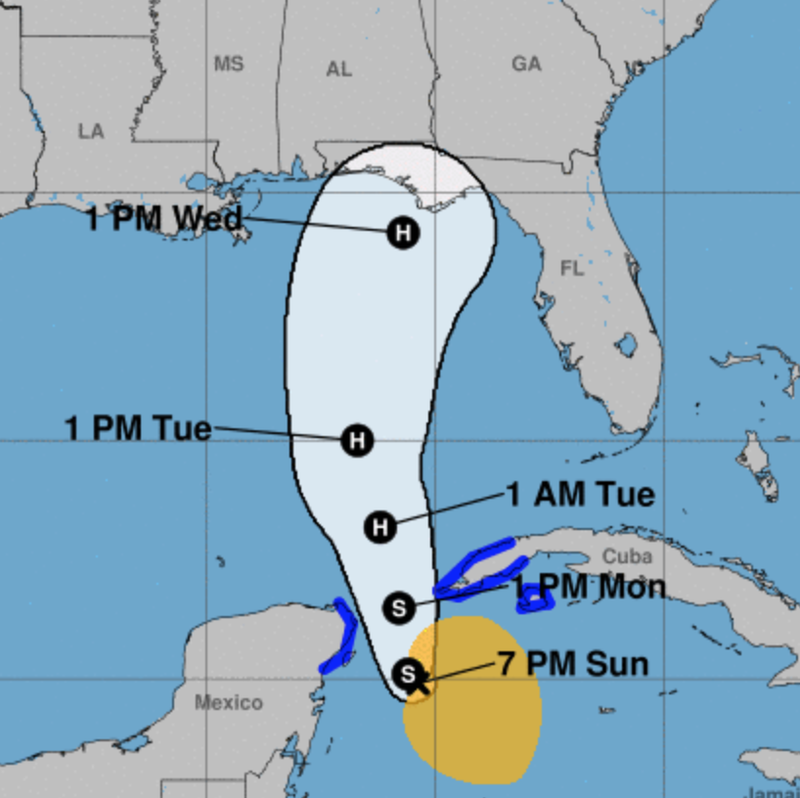 The first computer models with Hurricane Hunter data in them will be coming out tonight. I will update again tomorrow morning. Print out my suggestions below and please use them to prepare if you haven't already. I will do a complete update late this evening. So, What Do I Do Now™? There are a number of good lists out there. Here are my suggestions for things to do at this point with the storm about 2 - 3 days away. Most of the things I recommend will eventually be used even if the storm does not affect your specific location. Get prescriptions refilled now, especially if you doctor must approve the refill. If you should be ordered to evacuate, toss out any expiring food, clean cat litter boxes, empty all trash cans in the house, including bathrooms. Otherwise the odors could get bad. Gather your utility bill (proof of current residency! ), passport and any other important papers so you can take them with you if you should have to evacuate due to the hurricane’s winds and/or the hurricane’s flooding. Put together a "go kit. If you are in the hurricane high wind area, see this information for preparing your home. Prepare bottles of water by filling them 90% (allowing for expansion when they freeze) and putting them in your freezer. They will keep the freezer cool longer if the power fails. They will also serve as emergency water. Freezers stay cold longer when full. So, if you have two freezers, consider consolidating the contents. Pet food and supplies? I'm not an expert in pets so I leave that to you. Batteries for everything. Lots of batteries. Full charge for cell phone and laptop. Keep them fully charged. In Florence, some areas were without power for more than two weeks. If you have a relative at home that requires electricity for life-assistance purposes, you may want to move he or she outside of the higher wind zone. If you can get an electrician to install a generator, get it done. Do not try to install a generator yourself. At least one person died this way during Hurricane Florence. If you don't have a generator, get a power inverter or two. Radio Shack and similar stores sell them. They are a "poor man's generator" and will keep your cell phone, laptop, and similar items charged. Tell the person in the store what you want to run off it so you get one of the right size. Do not try to run the inverter for hours at a time as that is tough on your car's battery. Charge the (for example) cell phone and let the charge run all the way down, then use the inverter to recharge. Keep your car's gas tank full. If you live in a 100-year flood plain (you can check at city hall or your library) or on the coast figure out your evacuation strategy now. Make your list of things you will take with you. Be prepared to leave at short notice. Have a paper map of the region as your first choice of evacuation routes may be cut off. Fill a few gas cans (the type you would use for your mower) to have extra in the event of power failures for your auto or generator. Purchase extra food staples. Without power, stores will be closed. Things that require less preparation are better. Bottled water is especially important. Purchase booster batteries for your cell phone and other essential equipment. If you need insulin or other medicine that must be kept chilled make plans now! Consider what you would do if you were without electricity for a month. If you have an invalid living with you that requires electricity, there will be areas that will be without for weeks. Be proactive. Get to an ATM. Without power, credit card readers and ATMs will not be working. In a disaster, cash is king! If you are in the high forecast wind area, thoroughly photograph your home and possessions now. You will need it for insurance purposes. This includes trees, shrubs, etc. Then, if using a digital camera, upload to internet so it will be there after the storm in case the worse happens. You can use it then to document damage for insurance purposes if the worst occurs. Stay away from downed power lines! If you evacuate, turn off the main water line.